Juicy J is an American rapper, songwriter and record producer best known as a founding member of the Southern hip-hop group Da Mafia 6ix. Juicy isn’t a mediocre rapper. This is obvious when one regards the fact that he can brag about gathering a handful of awards and nominations. Between 2013 and 2014, he received 8 nominations for prestigious accolades ranging from the World Music Awards to the American Music Awards, MTV Europe Music Awards and BET Hip Hop Awards. He went on to win an American Music and MTV awards just as he did the Academy and HipHopDX Year-end awards respectively in 2006 and 2012. Juicy was born Jordan Michael Houston on April 5, 1975, and raised in North Memphis Tennessee. In 1991, he joined forces with DJs Lord Infamous and Paul, to found Southern hip-hop group known as “Backyard Posse”. The group later changed their name to Tripple 6 Mafia, then Three 6 Mafia and are now known as Da Mafia 6ix. They began recording under their label, “Prophet Entertainment” and were soon joined by other rappers like Gangsta Boo, Crunchy Black and Koopsta Knicca. Their EPs were marketed locally in Memphis and in the Mid-South. Three years later, in 1994, the group members founded another label called Hypnotize Minds. In 1995, they released their debut studio album “Mystic Stylez”. In the new millennium, The group began achieving greater commercial success. Their fourth studio album “When the Smoke Clears: Sixty 6, Sixty 1” released on June 13, 2000, debuted at #6 on the Billboard 200. Six months later, the album sold over 1 million copies and was certified platinum by the RIAA. The rapper went on to experience more commercial success with Three 6 Mafia. They signed a record deal with Sony Entertainment via which they released their sixth studio album “Da Unbreakables” in 2003. The album debuted at #2 on the Top R&B/Hip-Hop Albums and #4 on the Billboard 200. It also achieved gold status selling over 500,000 copies. Three 6 Mafia landed another breakthrough in 2005 with the release of their 8th studio album “Most Known Unknown”. It topped the R&B/Hip-Hop Albums chart and reached #3 on the Billboard 200. Within two weeks of its release, the album sold over 500,000 and before a year, it sold over 1 million to receive the platinum certification. It produced some of the best-known hits of the group like “Stay Fly”, “Poppin’ My Collar” and “Side 2 Side”. The album is greatly credited for launching them into the mainstream. In the following year which was 2006, their success surged with an Academy Award win for Best Original Song for “It’s Hard out Here for a Pimp”. They recorded the song for the movie – “Hustle & Flow”. The group has sold over 6 million album copies and remains active to this day. However, its membership often fluctuates due to internal disagreements which force some to launch solo careers. The group went separate ways in 2011 but reunited in 2013. Juicy, like most members of the group, launched his solo career in the early 2000’s. He achieved moderate success with his debut studio album “Chronicles of the Juice Man”, released in 2002. Between 2009 and 2011, Juicy focused more on his solo career. Thankfully, his third solo effort “Stay Trippy” released in 2013 under Columbia Records, achieved much more success. It spawned hit singles like platinum-certified “Bandz A Make Her Dance” ft Lil Wayne and 2 Chains; “Bounce It”, and “Show Out”. The album which debuted at #4 on the Billboard 200 also featured top acts like Trey Songz, Big Sean, Justin Timberlake, Young Jeezy, Chris Brown and more. At this time he had joined Wiz Khalifa‘s “Taylor Gang Records” and began collaborating more with his fellow marijuana enthusiast. In 2014, Juicy earned his first Grammy nod for Best Pop Duo/Group Performance, thanks to his feature on Katy Perry‘s Dark Horse. For the song, Juicy also won an MTV Europe Music Award for Best Video and an American Music Award for Single of the Year. Juicy reportedly commands about $200,000 to produce one song. His success has allowed him to live quite the life of luxury. In 2010 he sold his Sherman Oaks for over $1.8 million. He owns a 2014 model Rolls Royce Phantom valued at $402,000. The rapper also banks from the sale of his own weed strand called Green Suicide. In promotion of the strand, Juicy released a video of the same name with Wiz Khalifa. The song is also known as the Stoners Anthem. In all, the “Bandz A Make Her Dance” hitmaker has an estimated net worth of $25 million. It is known that Project Pat, born as Patrick Houston on the 8th day of February 1973 is Juicy J’s older brother. He is also a co-founder of the Three 6 Mafia and, was once jailed for robbery. 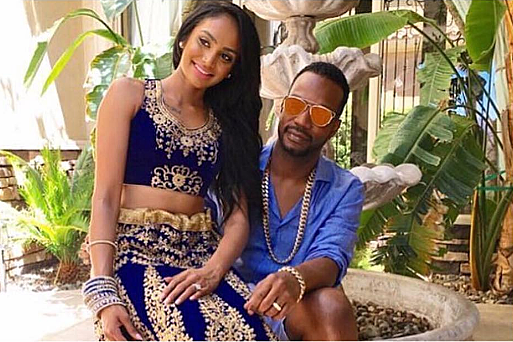 Unlike most rappers who have made it almost impossible for one to keep track of the people they’ve dated, it is a common knowledge that it has always been Regina Perera for Juicy J. While we are yet to find out how Juicy and Regina met, we can tell that they had a long-term relationship before they became life partners. Juicy got hitched to his long-time girlfriend in July 2016. The marriage came as a surprise to everyone as no hint about it was heard earlier on. As the story goes, the couple agreed to get married and decided to get on with it immediately without making any wedding plan. Thus, they had a spontaneous ceremony to mark the marriage in Sin City, Las Vegas where Juicy was scheduled to perform a few days later. Sometime in August 2017, it emerged that Juicy and his wife are expecting a baby. It will be the first child of the couple and it is going to be a baby girl.